ABC1 screens a UK thriller this Saturday night Case Sensitive: The Other Half Lives, the second in the Case Sensitive dramas. With its themes of love, obsession, trust and betrayal, this aired in the UK as a two parter, but screens as a 90 minute telemovie on ABC1. Music teacher Ruth Blacksmith (Eva Birthistle) is desperately in love with Aidan Harper (Theo James). She met Aidan, a gifted musician, when he came to tune the pianos at her school. So powerful were Ruth’s feelings that she left her husband within three weeks of meeting Aidan. But Aidan has dark secrets. He tells Ruth that once, a long time ago, he hurt someone – a woman called Mary Trelease (Emily Beeecham). Mary died. Ruth is deeply troubled. She knows the man she loves could never hurt anyone, but she’s worried about his past. Detective Sergeant Charlie Zailer (Olivia Willliams) meets Ruth at a gym class. She’s intrigued when Ruth tells her about a ‘friend’ who thinks her new partner might have a violent past. It is not long before Charlie decides to look into Ruth’s background. When Charlie decides to call in at Ruth’s house, she finds a disturbing scene. Ruth’s ex-husband, Jason Blacksmith has been murdered. 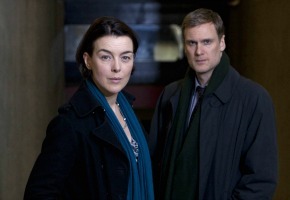 Charlie and Detective Simon Waterhouse (Darren Boyd) investigate the case and find themselves divided over motives and suspects. Ruth seems genuinely shocked and upset when she finds out about Jason’s murder. Aidan professes his innocence, yet doesn’t have an alibi. 8:30pm Saturday, 4th May ABC1. We really enjoyed George Gently – best thing the ABC has given us for a long while. Happy to see more episodes are going to be made (or have been?). Yes S6 still to come. Yes the ABC aired the first one some time in 2011 IRC. It was OK, the plot was a bit unbelievable in parts and her side kick is a bit annoying. The ABC sat on this one for a year and have used it, along with the 2011 and 2012 episodes of Inspector George Gently (which they were also sitting on), to make a block of 6 telemovies they could pair with with Last Tango in Halifax. Was the first of the Case Sensitives aired here? Answering my own question after looking it up, yes it was, in September 2011. It was called “Point of Rescue”, but too long ago to remember!